The WIAA released its brackets for the upcoming girls basketball playoffs. Play begins with regional quarterfinals on Tuesday, Feb. 19. Regional semifinals are Friday, Feb. 22, with regional finals on Saturday, Feb. 23. 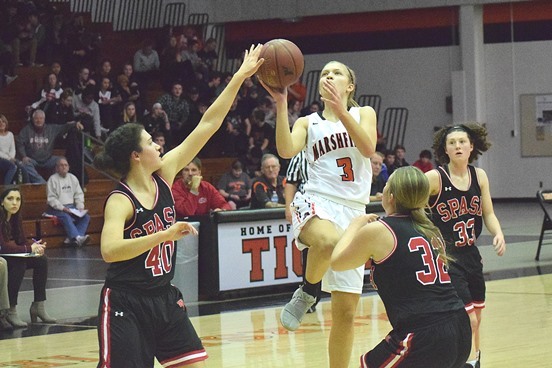 Sectionals are scheduled for Thursday, Feb. 28, and Saturday, March 2, with the sectional champions qualifying for the 2019 WIAA State Girls Basketball Tournament at Resch Center in Green Bay on March 7-9. Locally, Marshfield (9-11) earned a No. 10 seed in the Division 1 Sectional 1 bracket and will play a regional semifinal at No. 7 Wausau West (15-4) on Feb. 22. Marshfield won at West last Friday, topping the Warriors 71-67. Wisconsin Rapids (7-13) is the No. 15 seed in the bracket and will play at No. 2 Appleton North (13-4) on Feb. 22. The Marshfield-West and Appleton North-Rapids winners will play for the regional title on Feb. 23 at the higher-seeded school. Stevens Point (15-5), champions of the Wisconsin Valley Conference, is the No. 5 seed in the same bracket and will host No. 12 D.C. Everest (8-11) in a regional semifinal Feb. 22. Medford (9-8) is the No. 8 seed in Division 2 Sectional 1 and will host No. 9 Fox Valley Lutheran (8-9) in a regional quarterfinal on Feb. 19. The winner moves on to a regional semifinal at No. 1 seed Hortonville (14-5) on Feb. 22. In Division 3, Stratford earned a No. 2 seed in the Sectional 1 field and a first-round bye. The Tigers (13-5) will host a regional final Feb. 22 against the winner of the regional quarterfinal between No. 10 Black River Falls and No. 7 Altoona (10-9). A number of area teams are in the Division 4 Sectional 2 bracket. Undefeated Colby (19-0) is the No. 1 seed on the top half of the bracket and earned a first-round bye. The Hornets will play the winner of No. 9 Marathon (4-15) and No. 8 Phillips (7-11) on Feb. 22. Neillsville (16-3) is the No. 2 seed and also earned a bye. The Warriors will take on the winner of No. 10 Chequamegon (3-14) and No. 7 Westfield (9-9) in a regional semifinal on Feb. 22. Also in the same bracket, No. 5 Auburndale (10-10) will play at No. 4 Stevens Point Pacelli (13-5) in a regional semifinal Feb. 22, and No. 11 Spencer (3-15) will play at No. 6 Abbotsford (11-6) in a regional quarterfinal on Feb. 19. The Spencer-Abbotsford winner moves into a regional semifinal at No. 3 Necedah (14-3) on Feb. 22. In Division 5, Owen-Withee (13-5) earned a No. 3 seed in the Sectional 1 bracket and will host No. 14 Rib Lake (2-17), and No. 11 Greenwood (5-13) will play at No. 6 Gilman (10-8) in regional quarterfinals Feb. 19. In the top half of the Sectional 2 bracket, Wausau Newman Catholic (17-3) is the No. 1 seed and will play No. 16 Marion (2-16) at home on Feb. 19. Other regional quarterfinal matchups in the Sectional 2 field include: No. 12 Tigerton at No. 5 Marshfield Columbus Catholic (11-8), No. 14 Tri-County (4-15) at No. 3 Loyal (13-6), No. 11 Almond-Bancroft (8-10) at No. 6 Edgar (10-9), No. 10 Wild Rose (10-9) at No. 7 Athens (10-7), and No. 15 Pittsville (2-16) at No. 2 Wisconsin Rapids Assumption (16-4). Click here for the full state playoff brackets, courtesy of the WIAA.